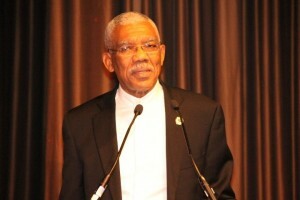 President David Granger addressing the Guyana State Dinner held in June, 2016 at the Sheraton Hotel in Manhattan, New York. President David Granger on Saturday rejected claims by a group of United States-based Guyanese that he is elitist and has repeatedly avoided meeting with ordinary Guyanese in New York. “My reaction is that those descriptions are erroneous,” he said when asked by Demerara Waves to respond to claims by several overseas-based Guyanese. Several “concerned Guyanese” including members of the North American Group of the People’s National Congress Reform (PNCR) met on September 24, 2016 in New York and concluded that they were being treated as outcasts and not afforded jobs by the APNU+AFC government even after mobilizing financial and other forms of support for the elections campaign. “I didn’t meet with any elite. I met the staff of the Permanent Mission and a photograph was taken and published in the newspapers. I did not engage the Diaspora because I went to the Diaspora in June and I engaged with the Diaspora in June; we had a 50th anniversary dinner,” he recalled. That State dinner by invitation only was held at the Sheraton Hotel in Manhattan, unlike the grassroots town hall and other open meetings in Brooklyn and Queens that were held in the run-up to the 2015 general elections. Locally, observers recently noted that Granger did not mingle with ordinary Guyanese after he addressed the launch of National Day of Villages at Victoria, East Coast Demerara but instead jumped in his car and departed. The group of New York-based Guyanese accused the Granger-led administration of failing to establish a Diaspora Commission or Department of Tourism and selecting a member of the Diaspora to become a parliamentarian. “I do not know that there is any provision in the Constitution for a Diaspora member of the National Assembly…There is a department in the Ministry of Foreign Affairs that is responsible for Diaspora Affairs,” the President said.